"I am impressed with TheLaw.net. I would not consider switching to the more expensive online research databases. The service is so helpful that I don't want to tell my competitors for fear they will catch up with my research capabilities!" - By developing and marketing highly affordable information retrieval tools for today's online law office, TheLaw.net Corporation has, since 1999, competed aggressively to establish meaningful, long-term business relationships in the marketspace dominated by West and Lexis. Click here to see what TheLaw.net looks once it has been installed on your computer. More than four million searchable judicial opinions updated four times daily, providing a viable alternative to: U.S. Reports, Federal Reporter and most state reporters. Meterless Access, means an end to "Outside The Plan Charges"
TheLaw.net is the best legal research value in America, no matter how you slice it! 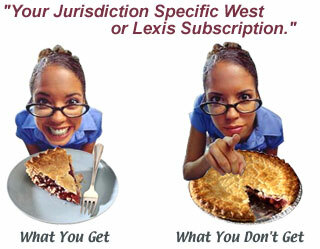 At the point-of-purchase, many participants in the legal profession complain to us that the web-based versions of West and Lexis have created more management issues than they solve with their selfish data-parsing policies and Outside The Plan Surcharges. Accessing needed items of information should be easier, cheaper and faster for a compusearcher than it used to be for a book researcher using a traditional law library. Instead, it's considered acceptable, even normal, for the online law office to pay a significant monthly licensing fee just for the privilege of having ongoing access primarily to mandatory precedent in its primary jurisdiction. But, as this "pie chart" suggests, under these plans the other 49 states, 12 Federal circuits and 94 Federal districts are not included. Worse still, a high toll is paid to traverse jurisdictional lines; a harsh economic reality that many users experience post facto. To avoid reading all of the opinions in the stacks, researchers have always paid infomediaries to enhance the usability of diffuse resources. Today, the dominant web-based research vendors continue to extol the benefits of (and charge dearly for) old-world editorial enhancements such as proprietary editor-generated headnotes, annotations, key numbers and the like; enhancements which used to be critical for the book researcher. Today, many compusearchers view such enhancements as superfluous second steering wheels in light of their ability to query a database with such a high degree of specificity. Master a handful of easy-to-learn search strategies and you may discover that the fat fees you've been paying to the premium vendors have actually been slowing you down. Subscribe to WestLaw and they will train you to slog through their expensive, mind-numbing proprietary interfaces and editorial enhancements. Lexis will do the same. Subscribe to TheLaw.net and you will quickly master some simple search strategies that unleash the power and capabilities that are already built into every personal computer. Enter your query, click SUBMIT and quickly find items in the database that have construed the controlling opinion, statute, regulation, rule, constitutional provision, canon or public law only for the reasons you specify. Receiving training from West or Lexis as to the best way to navigate their highfalutin graphical-user-interfaces is not the same as learning how to stretch your dollar by knowing how to get the most out of your computer! Once you bond with this simple business proposition, you may no longer care to fund these costly monthly subscription plans that can include outlandish surcharges simply because the items of information you really wanted to read originated in alternative jurisdictions or practice areas. 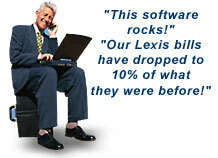 TheLaw.net Corporation is the best friend a small law office ever had! 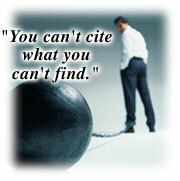 Search millions of judicial opinions with a national scope. Access Federal and state statutes, judicial and administrative rules, judicial and administrative forms, Federal and state regulations, tens of thousands of courts, hundreds of categories of Federal and state executive agency rulings, practice specific aids, thousands of bar associations from coast-to-coast, the advanced search interfaces of the web's best search engines, nearly four thousand newspapers, calculators, dictionaries, reverse search engines and much, much more. In addition to the resources that you have direct access to, if you ever have a problem surfacing a particular item of information (even if its not directly available to you via our database) we'll do everything we can to find it for you and email it to your desktop fast! Your subscription begins when you download and install our software. But, our business relationship is strengthened each time you access our hands-on research and reference support team who are trained to get you to the information you need fast, whether your inquiry is submitted via our toll free hotline, our site or via email. 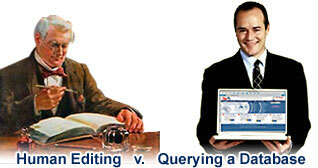 Our mission is to ensure you find the answers you need even if that means structuring the search query for you. Many people are doing online legal research for the first time using our flagship software application, TheLaw.net Professional. There's nothing stopping you. All of the above, and more, for less than $10 a week, or less, per user. Print, cut, copy, paste, view, download and never incur an additional charge. For immediate access subscribe now with the security of a 30-day unconditional money back guarantee! © Copyright 1999 - 2006 TheLaw.net Corporation. San Diego, CA, USA. All rights reserved.